Super PACs and other outside spending groups have been big news in the 2012 presidential race. But what kind of impact can outside money have at the state level -- especially in a battleground state like North Carolina? A new report by the Institute for Southern Studies, publishers of Facing South, finds that outside money aimed at state races in North Carolina has climbed to nearly $14 million. That record-shattering figure doesn't include spending which hasn't been disclosed yet, which could be substantial. The number will also rise in the coming days, as groups ramp up last-minute spending on tight races, like the contest for the N.C. Supreme Court between incumbent Paul Newby and challenger Sam Ervin. But the North Carolina case study is clear: Outside groups are bigger players in elections, including state elections, than ever. The Institute has been tracking independent election spending in North Carolina at FollowNCMoney.org, a website that draws on state and federal election filings. The site now has records of more than 550 expenditures totaling $13.8 million aimed at state-level races for 2012. Spending by independent groups -- those not officially tied to a party or candidate -- has exploded nationally in recent years. Outside groups received a boost with the Supreme Court's 2010 Citizens United decision, which loosened rules on how corporations and unions could spend political money. The actual amount of outside spending in N.C. is likely much higher than $13.8 million. State election officials have struggled to keep up with the influx of expenditure filings, delaying their disclosure. Groups often file reports incorrectly, report the same spending multiple times, or don't file at all, further undermining efforts to accurately track spending. * 2-1 REPUBLICAN EDGE: So far, Republican-leaning groups have shown a clear outside money advantage: 71% of the spending from the top 10 groups has come from Republican-leaning groups; 29% from Democratic-leaning organizations. In North Carolina's 2010 legislative elections, groups spending to benefit Republicans enjoyed a 10-to-1 money advantage over their Democratic-leaning counterparts. * TOP COMMITTEE: The single group spending the most money in 2012 so far has been the D.C.-based Republican Governors Association, which has filed reports showing $4.9 million worth of spending to benefit Republican gubernatorial candidate Pat McCrory. The RGA's donor list is dominated by national corporations. 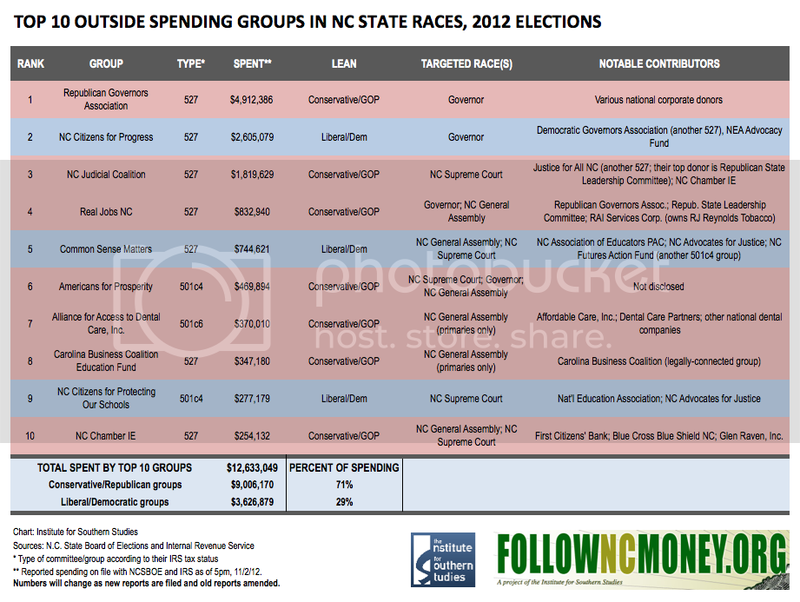 * BIGGEST RACE: The N.C. governor's race has attracted the most money, drawing more than $8 million in outside spending. Other leading groups spending on behalf of Pat McCrory include Real Jobs NC, Americans for Prosperity and the Constitution Trust. N.C. Citizens for Progress has been the dominant group supporting Democrat Walter Dalton, spending $2.6 million to benefit his campaign. N.C. Citizens for Progress' biggest backer has been the D.C.-based Democratic Governors Association. * NC SUPREME COURT RACE: As McCrory has extended his lead in the polls for governor, outside spending has shifted to the N.C. Supreme Court race. As of Friday, November 2, total expenditures in the race had topped $2.5 million, with more coming in the days leading up to November 6. The biggest outside spender in the N.C. Supreme Court race is the N.C. Judicial Coalition, which has filed reports showing $1.8 million in expenditures. The group's largest donor is another super PAC, Justice for All NC, which has received more than $1.1 million from the Republican State Leadership Committee.